HARPERSFIELD TOWNSHIP - Ferrante Winery and Ristorante celebrate another successful year at the American Wine Society Commercial Wine Competition that was held in Buffalo, New York, on Oct. 31-Nov. 1. Three of Ferrante’s wines, Pinot Grigio, Gewurztraminer and Gruner Veltliner, all were honored with gold medals, while seven of their other wines received silver. “I’m ecstatic, these wines we made are really good. We worked hard to make them and we are proud of all them,” said owner and winemaker Nick Ferrante. According to the American Wine Society’s website, The American Wine Society (AWS) is considered the largest consumer-based wine organization in the United States. For forty years, Amateur and Commercial wine competitions have been conducted and those that are recognized receive national recognition for their prestigious awards. Judges for the AWS Commercial Wine Competition complete a three-level course over a minimum of three years. Through this curriculum, judges learn about wine fault identification, component analysis, winery operations, viticulture, wine history and appreciation, and wine evaluation and rating. that it tastes so good,” said Marketing Director Alyssa Sekerak-Ollis. Ferrante’s 2017 aromatic white wines, Pinot Grigio and Gewurztraminer, were awarded the “Best” in their varietal categories. Ferrante is thrilled with the dedication that has transpired over the last year and is excited with the results shown through these gold medals. On Saturday, Dec. 1, Ferrante Winery and Ristorante held a wine tasting with the gold medal winners and encouraged the public to stop in. Ferrante discussed his progress and successes at the winery with patrons who enjoyed their tastings and an Italian-seasoned meatball. “We want people to have an interaction with the wine maker,” Sekerak-Ollis said. Overall visitors were impressed with the bold flavors of all three wines. think this medal can make the wine become a varietal that is just as popular as the Pinot Grigio,” Ferrante said. Gewurztraminer acknowledges floral and spicy flavorings that are either loved or hated by wine enthusiasts while. “You would think this would be German, but it has a presence in France and a large part of Italy,” said Ferrante. On Nov. 24, the 2017 Gewurztraminer and Gruner Veltliner were released and are available for purchase for the holiday season. “We hope to get these wines out in more restaurants, and we are looking forward to springtime to showcase our new reds, Pinot Noir and Cabernet Franc,” said Ferrante. 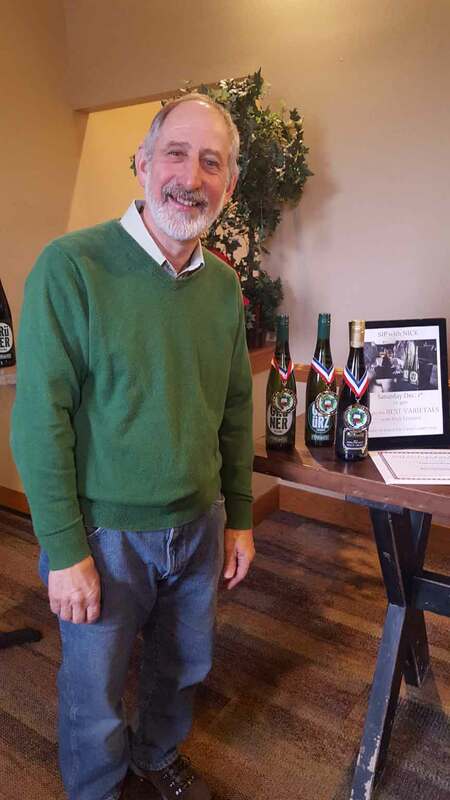 Nick Ferrante, owner of Ferrante Winery and Ristorante, stands proudly with his three Gold Medal wines.